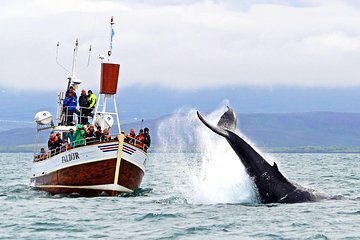 Observe las ágiles jorobadas y las enormes ballenas azules con una aventura de avistamiento de ballenas de 3 horas desde Húsavík en un tradicional barco de roble islandés. Disfrute de las impresionantes vistas de la bahía de Skjálfandi y las montañas de Vík mientras explora la costa, un lugar de peregrinación próspera para los mamíferos marinos en la temporada de verano. Aprenda sobre la vida salvaje y la cultura de Islandia con comentarios en vivo de su guía experimentado, luego finalice el recorrido con un bocadillo tradicional de chocolate caliente y donas islandesas. Tour de avistamiento de ballenas de 3 horas. Esté atento a la vida silvestre con guías naturales experimentados. Experimenta la bahía en un tradicional barco de roble. We did see a whale, the same whale a few times, from a distance, as our converted fishing boat was too slow to keep up with the ribs, that rushed to the sight of the whale, which then seemed to take a few deep breaths and dive again as soon as possible, before becoming too traumatised by aforementioned ribs! We have been on whale watching trips before and all of the boats took great care to remain behind the whale and out of it's sight so as not to upset it. Here it was a mad dash to the whale by all, and the poor whale understasndably dived as soon as it possibly could. Our tour was canceled due to very bad weather extremely windy and rainy. Luckily, it was the last tour in that day and we got the first morning next day tour instead. The weather on the morning was great. Blue sky. As promised, we saw whales. I took dozens of photos of them. Great experience. Great tour with lots of helpful information. Plenty of whales to see! It was really amazing! We saw humpback, minke and porpoise wales! Unfortunately at this time the sea was rough so passengers should be seaworthy. The crew were very freindly and report us many things about the wales. Definitely one of the biggest highlights of our entire Iceland roundtrip. The staff was extremely friendly, our guide Aksel was a great and funny guy and thankfully luck was on our side as well as we were able to see three ! humpback- as well as quite a few minke whales. This tour was really amazing !!! I saw twelve whales and ten dolphins very close !! !